The album starts out with "Unite". With it's, at first, terribly uncoordinated Keyboards, which turn very symphonic and refined, turns into an awesome thrash song! The vocals were probably the most unique thing about this band. Sounds like early Living Sacrifice, which it should as LS was heavily influenced by Believer. "Vile Hypocrisy" started out with the double bass pedal and the bass guitar. And it sounded amazing! Believer did a great job. The song almost has a groove to it. "D.O.S. (Desolation of Sodom)" is not a bad song. It's a decent song, but not super Thrashy. Not my favorite song. It is kinda low on the thrash scale, but a decent song. "Tormented" has almost a Math/Groove Metal feel to it. It's very interesting. The bass is also very evident which is cool. It's later becomes more thrashy and loses its Math but definitely keeps the Groove going. "Shadow of Death" is very thrashy! (I now I realize that have used that word a lot!) It's pretty awesome. So is the solo they throw around the middle/end! "Not Even One" starts with a Mathy kids sounding guitar, and then has Vocalist Kurt Bachman's signature Vocals. Drummer Joey Daub does an amazing job on this song too! The song ends very abruptly and weirdly. "Stress" is more like a jam song. Or at least that's what it sounds like. Bachman sounds a lot like Mark Salomon of The Crucified in this song. This song ends also kinda abruptly as well. 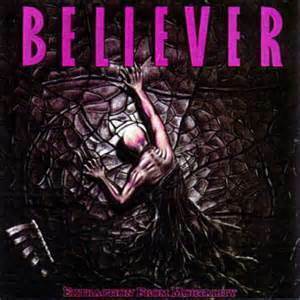 Believer did an amazing job on their debut album. This album came 20 something years ago, so no one cares right now, but it's still a significant part of Christian Metal.